My cakes are all bespoke designed for your special occasion, made with only the finest ingredients and local free range eggs from our village farm. These cakes are offered in traditional moist ‘Brandy’ rich fruit cake, vanilla sponge with raspberry jam and vanilla butter cream filling, moist chocolate cake, lemon or carrot cake. Gluten free cakes can be made on request. All my cakes are offered in a selection of designs and shapes from traditional round, square, heart, hexagonal, oval or petal shaped, along with a range of cupcakes. 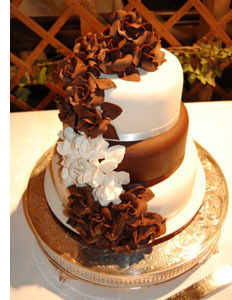 All my cakes are tailor-made for you and can be offered in a selection of shapes and sizes. Hand-crafted sugar flowers are my speciality. I have a large selection of cake stands with a ‘bridal cake knife’ which are available to hire and compliment your cake. A local delivery service and set-up is available free of charge, destinations further afield may be chargeable. Have a look at my cake galleries (links above).